Featuring: Lauren Bakst (USA), Isak Berbic (USA), Jose Castrellon (Panama), Jesse Chun (USA), Ryotaro Fuyuki (Japan), Maya Jeffereis (USA), Sukjoon Lee (Korea), Wonwoo Lee (Korea), Umber Majeed (USA), Annesofie Sandal (Denmark), Freya Powell (USA), Merel Visse (Netherlands), Lu Zhang (China). NARS Foundation is pleased to present Of Tongues and Hands, a group exhibition featuring the work of current artists-in-residence. During their 3 or 6 month residency, this group of thirteen international artists have focused on developing their individual practices and research projects that range from engaging with collective and personal histories, memories, and languages to exploring intimate relationships, the body, and materiality. In the process of working alongside each other affinities, collaborations, and exchanges have emerged that will continue to be explored as the gallery, in addition to the artists’ studio, becomes a space for making, sharing, and showing work during their last month in the residency. Lauren Bakst presents iterations of her work-in-progress Private Collection, a body-based, open-source archive that indexes psychic and somatic architectures of intimate relationships. In the gallery, Private Collection (Room) is a performance on the screen for one person, layering multiple temporalities in one frame. During the opening, pulling from Private Collection, Lauren Bakst, joined by collaborator and performer effie bowen, offers a series of performances for one audience member at a time in her studio. Isak Berbic's recent work reflects on contested histories and the limits of representation through his use of fiction and documetnts, found and primary material, and explores the image and the literary in the construction of his pieces. On a recent trip to southern Bosnia and Herzegovina, he visited a remote medieval necropolis. He photographed bar reliefs or engraves pictograms on the tombstones. Seen from today's visual culture these images are at once foreign as they are familiar. Appropriating the infamous Panama palindrome, Jose imposes it over a 1907 advertisement for the newly renamed Panama City, Florida. George Mortimer West, a real estate mogul, rebranded the city after the Central American homonym to capitalize on the recent hype surrounding the United States' purchase of the Canal in 1903. Jose draws a parallel between US expansionism and imperialism in Panama and homegrown land grabs and real estate speculation. Jesse Chun's In a Manner of Speaking, an ongoing series of modular panels, presented here as a triptych, draws from the artist’s interests and transcultural experience with language. English and Korean, numerals and codes, redacted keyboards indexes and bibliographies—both found and imagined, are mixed to compose Concrete Poetry and highlight the navigation between multilingual system, the familiar and the foreign. At the start of his six month residency, Fuyuki installed a mirror in his studio and instructed the NARS staff to throw a metal bearing ball at it if they felt negative feelings, like impatience or frustration. No one did! Ryotaro took this as proof that no one had such negative feelings before the exhibition so he renamed the piece “Peace Mirror.” The instructions, however, still hang in the staff’s office. Ryotaro’s work focuses on making the end place between the emotional subjective viewpoint and the analytical comprehensive one. He thinks about emotions the same way as science and mathematical formulas. His art is the method for them. Maya Jeffereis' Fallout Shelter is a thought experiment about ethics, identity politics, and nation-building that envisions a post-apocalyptic survival scenario with occupants of a fallout shelter. Dozens of participant-performers improvised their roles in a video confessional format, resulting in a polyphonic narrative that complicates identity politics and speculates on a utopic society. Revealing moral values, biases, and ideals, the video confessional and documentary interview formats service to conflate fact and fiction and to complicate the performance of character versus the performance of self. Sukjoon Lee creates open stages through kinetic and interactive objects that center viewers, calling them deeper into themselves and in relation to the world. Raindrop player is a sound box based on lenticular animation. As we divide the natural state into units such as minutes and seconds, the color barcodes are cut into pieces. This sound box reproduces specific musical notes and raindrop images by recombining the barcodes. 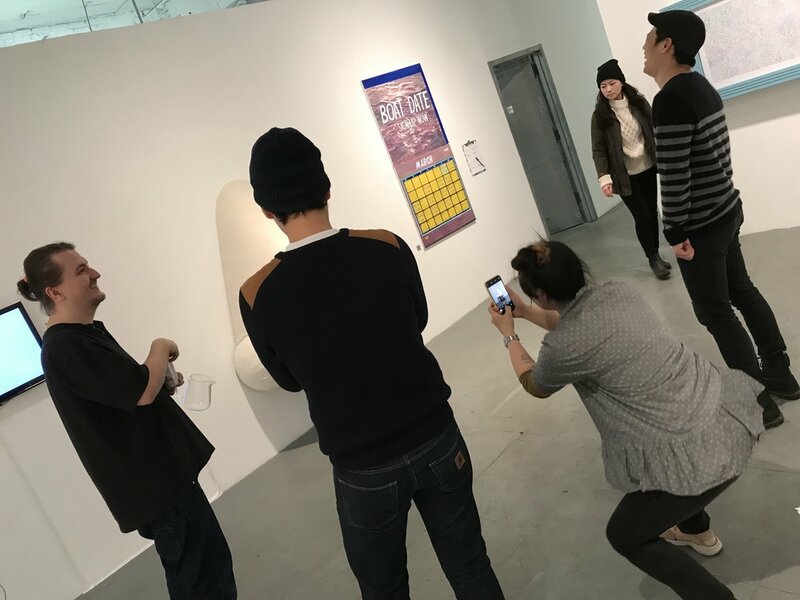 Wonwoo Lee's The Nose is a sculpture that the audience member can touch and enter. Stemming from his interest in “Giants,” as part of a broader inquiry into combating “Anxiety,” Wonwoo's sculpture is also a small room one can sit inside of, becoming a giant, their legs and feet dangling through the nostrils. Alongside giants, the artist’s other methods for defeating anxiety include good luck, dancing, and traveling to the future. These are not offered as solutions as much as evocative attempts through humour and comical situations. Noses, as do giants, hold significant meaning in Korea, symbolizing someone’s pride or dignity. Plastic surgery, especially lifting one’s nose higher, is as a result very widespread among both men and women. The higher nose becomes a shield one can hide behind. In his sculpture, one can recognize someone is behind the nose because like in a fitting room or bathroom stall the legs are hanging out, but not know who is inside it. Umber Majeed's Hypersurface of the Present is a drawing installation that maps out how green light functions as a mode of sprituality perpetuated and disseminated by Pakistani nationalism, Islamic orientalism, populish green screen interface, and light therapy. The absurdist diagrammatic pencils on paper depict visual perception essentially highlighting the movement of a green cone as a stand in fugure for state hegemony. The materials presented are research materials around the artist's in-progress/extension animation series, Atomi Daamaki Wali Mohabbat (The Atomically Explosive Love). By combining lists of words associated with the emotional impacts of trauma and excerpts from Shakespeare's Hamlet paired with the imagery of waves crashing and the kneading of clay, Freya Powell's video attempts to portray, visually and aurally, the inner turmoil of trauma. Annesofie Sandal: According to The European Candle Association the Danes burn more candles per inhabitant than anywhere else in Europe despite the fact that candles shed more particles than cigarettes or cooking. In 1446 the Hangul Alphabet was introduced to the Korean people to promote literacy amongst the common people. Foreign occupation and influences might be the explanation behind a still existing illiteracy amongst older generations. October 9th is official Hangul Day in South Korea. Fur trading started as an exchange between Indigenous people and Europeans and played a major role in the development of North America. Large parts of the border between Canada and the US traces the old trading territories. Todays farmed mink are often raised in pairs, as farmers have learned it results in calmer and healthier fur. The 23rd pair of chromosomes determines gender in a human being – Translocation happens when a chromosome part is rearranged. This can happen balanced or unbalanced. Merel Visse's The Withheld is about what is beyond our grasp, yet acting upon us. The axion x = x+ emphasizes that words, symbols, and images all point beyond themselves. All mean more than initial encounter suggests. In our relations with others and with works of art, there is a continuous interplay between grasping what a work asserts or claims and understanding what the assertion indicates or signifies. This is a distinction between what a work expresses (or states) and what comes to expression in it (what it discloses). Grasping the first requires an analytical approach whilst the second demands participation in a speculative way. For example, when a musical work (x) presents itself to an engaged participant, the work also discloses the broader horizons of meaning or speculative fields (x+), which constitute it and give it its significance. The part (x) discloses the whole (x+) but only partially, as the whole (x+) can never be fully captured in images or concepts. Lu Zhang's It Takes Ten Years Practice to be on the Same Boat is a dating experience inside a Chinese river boat, made of ceramic, reed, steel and wood, in the artist’s studio. Lu designed a website through which individuals can sign up to meet up as part of the project, which is ongoing throughout her residency. In the gallery, she presents two paintings of screen grabs of the website, which replicates Chinese pop-culture characters and aesthetics. Lauren Bakst, joined by collaborator and performer effie bowen, will offer a series of performances for one audience member at a time in her studio. These performances-for-one pull from Private Collection, a body-based, open-source archive that indexes psychic and somatic architectures of intimate relationships. Lu Zhang’s project It Takes Ten Years Practice to be on the Same Boat is a dating experience inside a Chinese river boat, made of ceramic, reed, steel and wood, in the artist's studio. Drinks and snacks will be offered on a ceramic Chinese checkers and tea table. This project is ongoing, with new dates coming in March. Sign up on the project’s website. Wonwoo Lee will be holding a Lost & Found session in his studio. Request something that you have lost in your life, and the artist will work for 10-15 minutes using leftover materials to "find" your lost object.